The cover designer has gone for that minimalist look, trying for the 3D-peeling-away-the-paper. If you know what the Me Before You cover looks likes then you can recognise the brown paper and stars peeking through underneath. 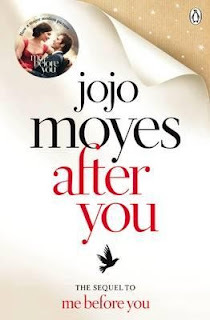 As well as the fact that it couldn't scream that is is the 'sequel to Me Before You', with it pasted all over the front cover, along with that annoying 'sticker' that isn't a sticker. One thing that really caught my attention on the cover is the inclusion of a single bird in flight. A sure symbol of the hope and the struggle of grief that follows Will's death, and the freedom and liberty that is to come in the novel. I don't remember the last time that I was able to think: "Wow! I actually enjoyed that contemporary romance book." But, here I am. Wow! I actually enjoyed that contemporary romance book. Three stars? I know, but usually I will rate them at a two and lower. You don't want to know the number of contemporaries that I have actually DNF'd. I read Me Before You sometime last year and really enjoyed it. The focus on both suicide and assisted suicide a topic I never really thought of exploring, to expand on the morality of the situation on the basis of whether this is something that should perhaps be more lenient in terms of the law. As much as I think no one should consider to take their own lives and shouldn't have to reach that point, it should be a matter of their own decision to make to live or take their own lives. -the start of the novel see's Lou back in a dead end job not getting anywhere, the life she promised to live to Will seems a little non- existent at the start of the novel. Until Lou falls off the roof of her flat after hearing a voice on her fire escape. Then it all gets a bit awkward and crazy from here. Lou still remains her own bubbly, chatty self even after the events of MBY (Me Before You) which made for a warm welcome. Moyes tackles grief in the multiple ways that can differ from every individual through her "Moving on" meetings that Lou attends throughout After You. If you were going into this expecting no romance and a woman still hung up about her past love, then you will highly be disappointed. But, I think most people will like Sam. He was cute. Granted my heart didn't soar high in the sky, with my brain squealing how I ship them so hard-- much to the chagrin of Will Traynor. As much as this seems to have been a gush, leaving many people wondering why I haven't given it a star rating higher than three was because I genuinely thought it was okay. I just wasn't as emotionally invested in aftermath of MBY. Perhaps I had just left it a bit to long between for the emotional pact to really set in my heart and make my eyes leak. I kind of wished that I had left that Lou living her life in Paris in my head.